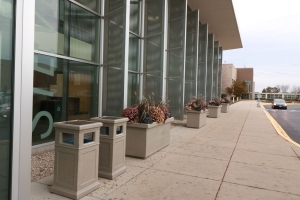 Concrete planters and bollards are great for adding security to any building, including schools. Whether by accident or intentional it is possible for vehicles to crash into schools. 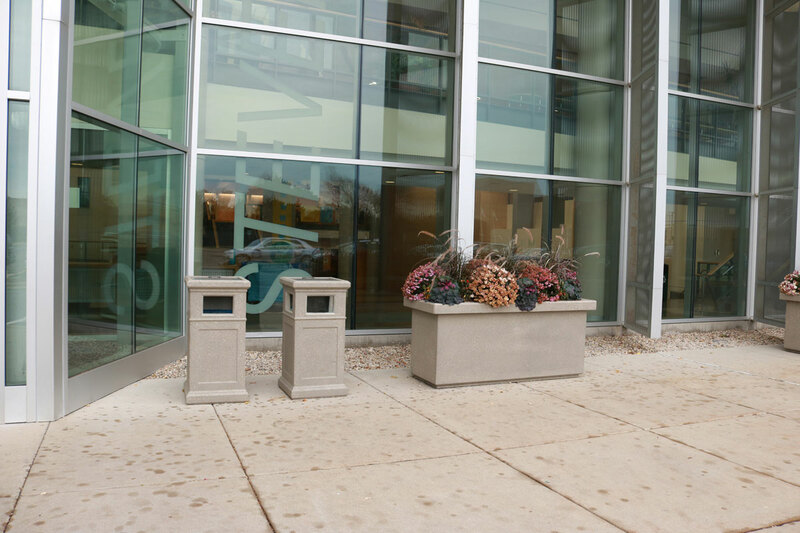 Concrete security planters and bollards are great for adding security and be decorative at the same time. 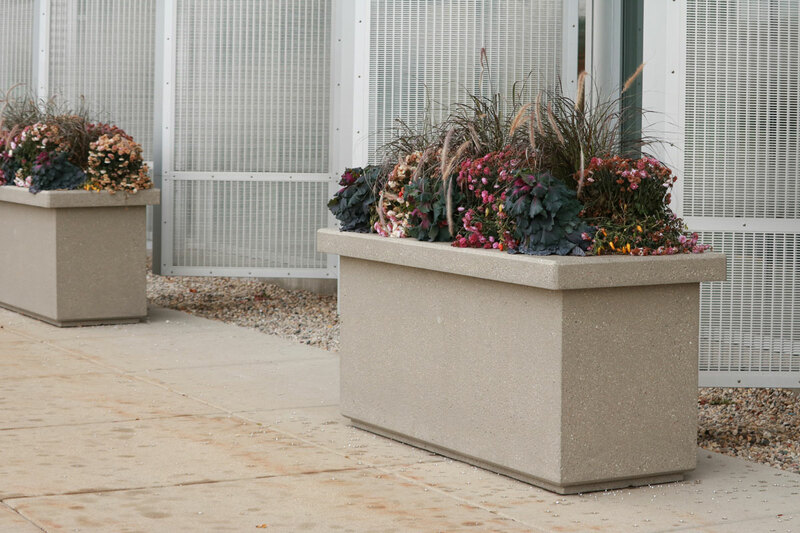 Doty & Sons manufactures a complete line of decorative and security planters. We also manufacture a complete line of security bollards, both permanent or movable, set on top of existing concrete. 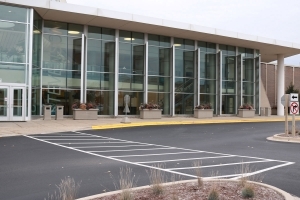 Last year Doty & Sons was contacted by officials from Adlai Stevenson High School District 125, located in Lincolnshire, IL. They inquired about purchasing planters and bollards for the school. They were concerned about vehicle security at the school. Several areas on the school campus were not secure, vehicles could possibly run into the building. School officials wanted something nice looking, but also large and heavy enough to stop a car from running into the building. After looking through our catalog and web site they decided on purchasing concrete bollards and planters for the campus. The security planter size they selected was 72” X 24”x 30” high, Item P722430. As per their request, Doty & Sons made special custom caps for the planters. The caps added height and a decorative element to the planters. Bollards selected were 16” square x 36” high, Item number B161636. Other items purchased were concrete litter and recycling receptacles LR2142 and sign post blocks. Doty & Sons manufactures a complete line of litter and recycling containers, tables and table sets, benches and outdoor game products. Call toll free 800-233-3907 to talk to one of our knowledgeable sales staff. We will be glad to help answer any question you may have. Photographs show the building after installation. 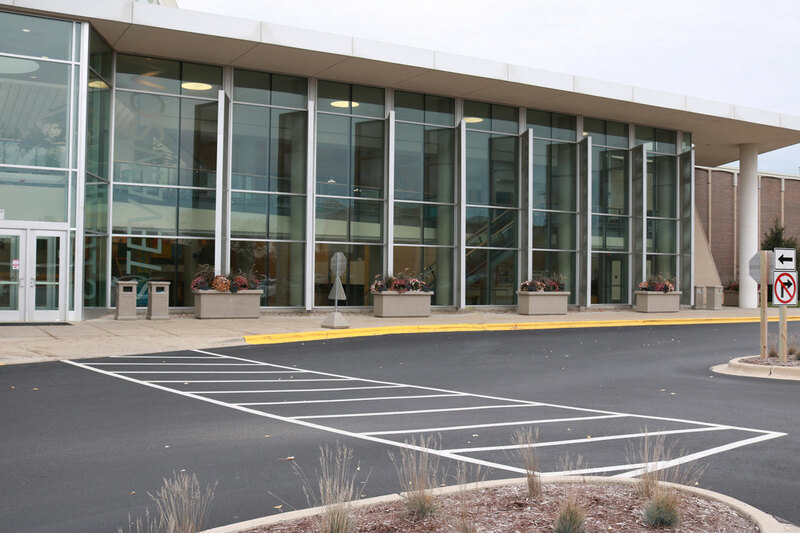 The bollards purchased were installed at other entrances on campus. Rectangular planters with custom caps. Concrete Litter and recycling containers with rectangular planter with cap.